Eoin and I have updated the AD template and Quick Reference Card to reflect the changes we made for Edition 2. If you’ve downloaded any of these documents recently, please download them again to get the revised versions. All comments welcome! Eoin ran a session for IASA UK chapter in London with Chris Cooper-Bland and Paul Cavanagh on 7 November. 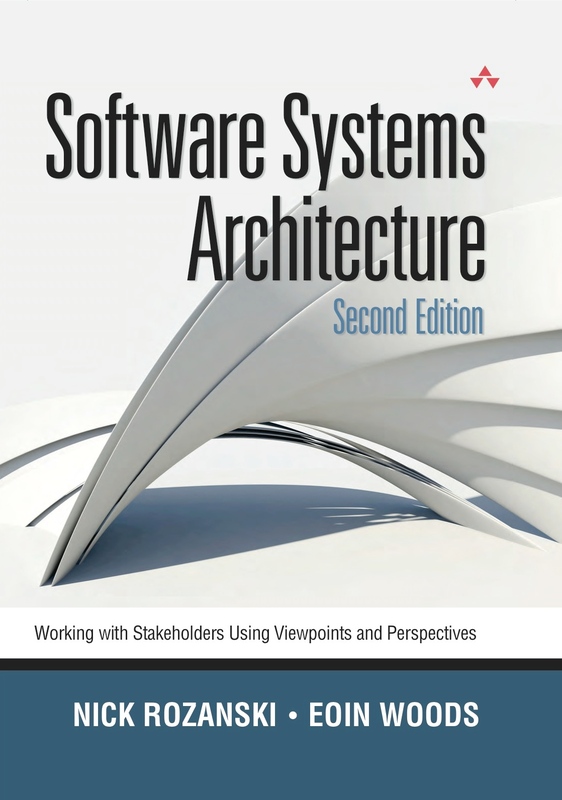 Welcome to the new website for Edition 2 of Software Systems Architecture! Edition 2 was published in November 2011 and is a major revision of the original book. We have updated most of the chapters and added over 130 pages of additional content. The most important changes in this edition are as follows. We have introduced a new viewpoint, which we call the Context viewpoint. This describes the relationships, dependencies, and interactions between the system and its environment (the people, systems, and external entities with which it interacts). It extends, formalizes, and standardizes the relatively brief discussion of scope and context that used to be in Chapter 8. Powered by Wordpress 5.1.1. Site design by perspx. Homepage texture from Subtle Patterns.